The truth is, no leader is perfect. But there are some common things we do to undermine the trust, credibility and integrity that is so necessary for effective leadership. These are the mistakes I most often see, and getting just one of them wrong consistently over time will pretty much negate any positives from getting the others right. So, no pressure, but here we go. 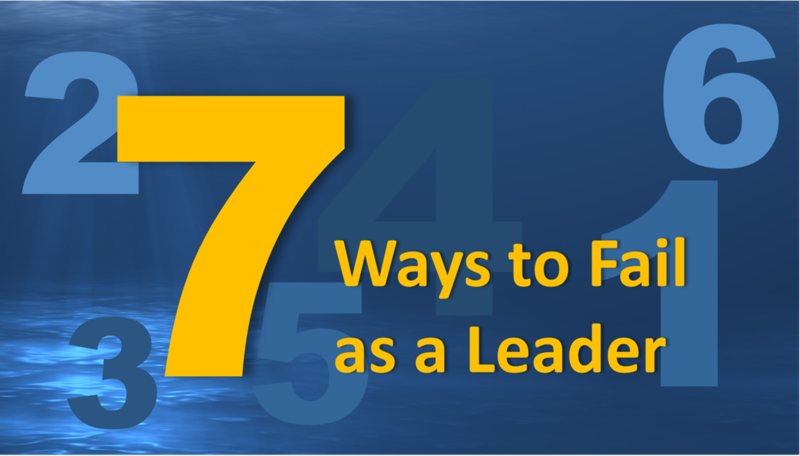 This is the fastest way to be the leader everyone hates to see walk into the room, or see on their caller ID. When you need to correct someone, do it privately, discretely and respectfully. Be a grown-up here. Public shaming may be cathartic for you, but if it is, you probably should not be in leadership. Emotionally healthy adults really should know better. Your goal as a leader is to shape behavior, not crush their spirit. Nobody loves having the rug pulled out from beneath them. If you are routinely setting up expectations only to change them, you're either not doing your job before you set the expectations, or you are led too much by caprice. Either way, those under your leadership will begin to doubt everything you say. If you want people to trust what you say, be consistent unless there is an extraordinary reason why carefully crafted expectations need to change. You may have the best idea in the world. You believe in it. Those working with you believe in it. Then the next idea captures your attention and your vision loses momentum. Do this just a few times, and even the best idea on the planet will be shrugged off by your people as just another passing whim. (Personal confession: I struggle most with this one.) Following through lets people know that you will not abandon them and leave them on their own. It increases their willingness to do more for you in the future and to recruit others. Manipulative leaders attract incompetent and immature followers. The competent and mature see right through this kind of thing, and they don’t stick around long. So be straightforward with people and trust them. Even if they come up with an idea that is not quite as good as yours, if it accomplishes the same goal, go with that person’s idea. The trust and loyalty you build is usually worth far more than the difference in quality or effectiveness between your great idea and their good idea. Sometimes the best thing in the world for your organization is the success of another organization like yours. You can learn from their success. And sometimes, their success is the worst thing for yours. If you are always chasing another person’s success by copying their ideas, it will be really difficult to grow as a leader. Cool new ideas are meant to prompt your own creativity, not be a substitute for it. This is a great way to lose your most creative and innovative people. I will address the solution at the end of #6. The tactics used by successful organizations grow out of a strategy developed to serve and accomplish a mission specific to them. Those tactics do not always translate well to another context. When those in your organization catch on to what you’re doing, they begin to lose respect for your leadership. Like you, they begin to trust in tactics, not the people who should be creating and implementing them. So learn from the new ideas and best practices of others, and let them inform you. But develop your own strategy – your own way of serving your mission – and let the tactics and your own best practices grow out of that. Don’t read anything that will stretch or challenge you. Don’t learn anything new. Play it safe and view failure as the enemy rather than a learning experience that makes you wiser. And don’t recruit others who want to grow. If you do, they will be constantly frustrated with you and their work. But you won’t have to put up with them for long. Or, you could do the opposite of all these things and your success and that of those who sign on with you, may be beyond anything you could imagine. May your leadership avoid each of these mistakes, and may you continue to grow as an effective leader, bring others with you on the way, and add value to their lives even as they add value to yours.